Howard Elementary School teacher Margaret Bonson was sitting in the same class she now teaches in, when the events of Sept. 11, 2001 occurred. Seventeen years later she has the chance to help teach students about what happened on that tragic day. In fact, students from around the Bald Eagle Area School District learned about 9/11. 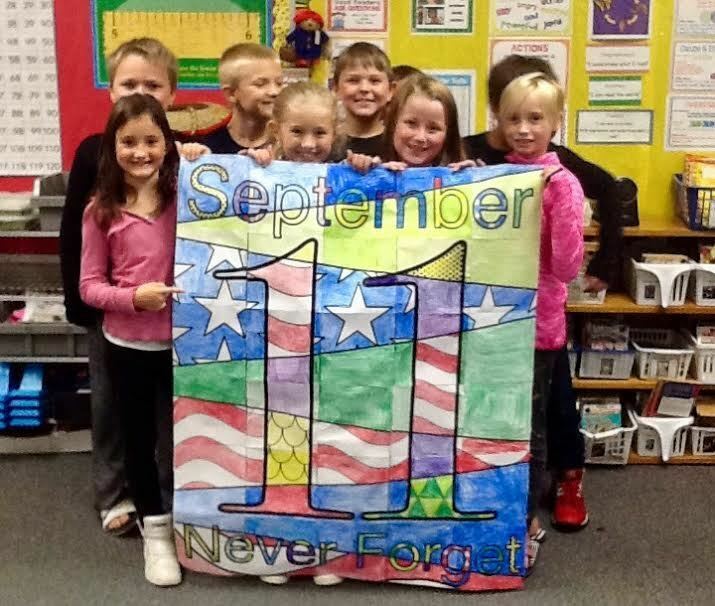 Howard Elementary School students in third through fifth grades participated in a 9/11 project. They read an article posted on the History Channel’s website about the attacks and events that lead to the actions, and then created a timeline to understand the events in detail, which Bonson said was a great way to help the younger students get a better understanding of a day they never experienced. A TV that was once placed in the corner of the classroom has since been removed, but Bonson said she remembers that TV being on the news most of the day as the events unfolded on national television. “I can almost feel the events unfolding as I sit in my own classroom year after year – the same place I was sitting 17 years ago,” she said. During the project, Bonson said the third-grade students had the most pressing questions. During a discussion about the heroes of 9/11, such as firefighters, police officers, other first responders and more, one student started to tear up when talking about the worries she has for her dad who is also a volunteer firefighter. Fourth- and fifth-grade students were more so interested in the smaller details, such as the number of people killed, the terrorists behind the attacks and times the planes crashed. At Mountaintop Area Elementary School, students in Sue Pratt's third-grade class participated in a series of activities that helped teach them about 9/11. Pratt said that included reading "September 12th: We Knew Everything Would Be All Right" -- a book written by first-grade students and their teacher at a school in Missouri; watching a video called, "Patriot Day" that outlined the details and showed pictures of what happened on Sept. 11, 2001; and also reviewing photos of memorials built to remember the people who died in the attacks, including the one near Shanksville, Somerset County -- the site of the United Flight 93 crash. "My third-grade students were so interested to learn about everything that happened that day," Pratt said. "I wanted to remind them that even though sometimes bad things happen, it is not the end. ... One of my kids said, 'Yeah, even though there are bad people in the world, there are a lot more good people'." However, Pratt said that perhaps the most important topic the class discussed was the heroes who helped in so many ways, and read the "Fireboat: The Heroic Adventures of the John J. Harvey." They then ended the lesson with a collaborative art project comprised of 30 pieces colored by students.